Free Shipping Included! 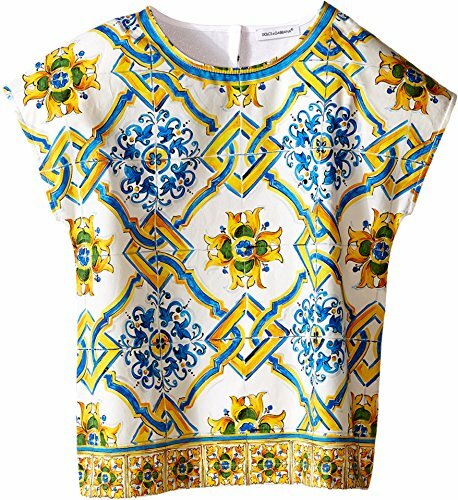 Dolce & Gabbana Kids Girls' Medallion Print Top (Little Kids), Tile Print, 4T (Toddler) by Dolce & Gabbana at Blood of The Young. MPN: L5JT3VG7HGZ-S9000. Hurry! Limited time offer. Offer valid only while supplies last. Colorful luxury will be be all hers while your young lady enjoys the day in her Dolce & Gabbana™ Medallion Print Top. Crew neckline. Short sleeves. Colorful luxury will be be all hers while your young lady enjoys the day in her Dolce & Gabbana™ Medallion Print Top. Crew neckline. Short sleeves. Brand name stitched at collar. Allover medallion graphic print adored with pastel colors. Back snap placket closure. Pull-on construction. Straight hemline. 100% cotton. Machine wash cold, dry flat. Made in Italy. This item may ship with an attached security tag. Merchandise returned without the original security tag attached or a damaged tag may not qualify for a refund. Measurements: Length: 16 1⁄2 in Product measurements were taken using size 6 (Little Kids). Please note that measurements may vary by size. Colorful luxury will be be all hers while your young lady enjoys the day in her Dolce & Gabbana™ Medallion Print Top. Brand name stitched at collar.